Ductwork leakage is often, and correctly, cited as the single largest source of causing the most additional energy use in the built environment. Based on a survey of predominately rectangular duct systems, the annual cost of this energy waste runs into the billions of dollars. Engineers, code officials and owners are taking notice and questioning the use of ducted HVAC systems. There is a simple ducted solution, factory fabricated spiral duct and fittings. It has long been recognized that spiral pipe systems leak a great deal less than comparable rectangular systems. Eastern Sheet Metal is proud to bring these changes to you as a result of your feedback. The site has been designed for all of our customers including contractors, engineers and our factory representatives. Contractors can find dimensional cut sheets, gauge selections and complete Eastern Sheet Metal catalogs. You will also have access to our new expanded representative locating tool which will lead you to your local ESM Representative and to your local ESM Stocking Distributor of the self-sealing Eastern Tight spiral duct system. 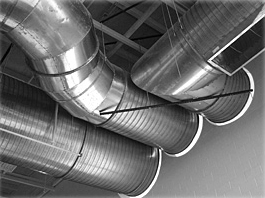 Engineers can utilize our handy constant volume duct size calculator. Enter CFM and the desired pressure drop and the calculator returns available round and flat oval spiral sizes. We also have suggested specifications in an easy to use quick paragraph format. ESM Representatives can login into to their extranet site and to download the latest software tools, sales and marketing information. Included will be an upload/download feature to send drawings back and forth for estimating and ordering ultimately to get our spiral ductwork to the job site quick! We hope you enjoy our new website. We always look forward to your feedback and suggestions for even more features you’d like to see.